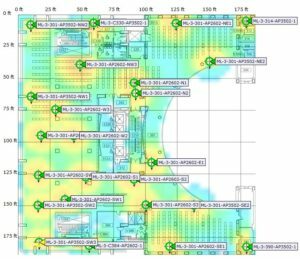 Over the past several months, PSU Library and the Office of Information Technology (OIT) collaborated to improve the wireless network in the Library. The goal of the project was to maximize wireless coverage and capacity on the library’s busiest floors (the first, second, and third floors), while also replacing the oldest wireless hardware still in use. We added 23 new wireless access points to the first, second, and third floors, and moved 36 others. As a result, coverage and wireless capacity are significantly improved, now supporting up to 440 more devices simultaneously (a 32% increase in maximum capacity!) on these floors alone. Throughout the library, wireless coverage should now be more uniform, with blanket coverage on the first, second, and third floors. Thanks to the Library and OIT staff who worked on this project! 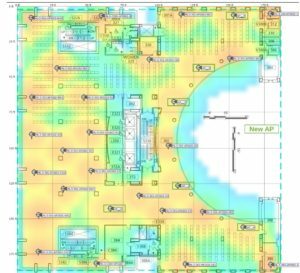 The images below show the wireless heat map of the third floor before and after the project. The green means limited wireless coverage; orange means strong coverage.